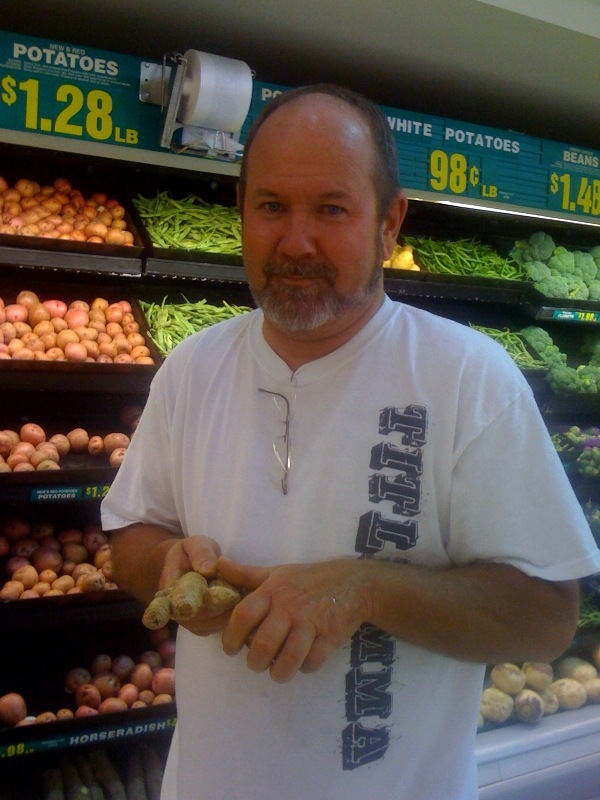 Steve and I took a trip to the supermarket this week. See him above holding some ginger root? He's not considering buying this, he's telling me that the root looks like my toes, you know I only have two toes per foot. I must admit there is a striking resemblance. 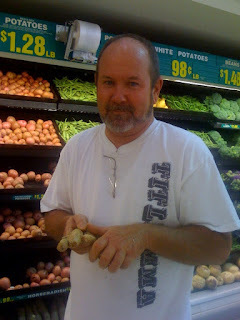 Did you know that ginger root is $6.00 per pound? I told Steve that if we ever got to needing money real bad, I could see about cutting off my toes and selling them to the supermarket. I've had several doctors suggest amputation already so I'm sure they would be willing plus we could call them "organic" and get $8.00 per pound. Steve said he wasn't sure that the ginger root would ooze red stuff like my toes but if need be he could come back and do a test to see. I thanked him for his offer to help and told him since he was so nice, I'd surely take one for the team and take that $8.00 per pound to the bank! My air conditioning is on the fritz in my car and the repair shop estimated $2400 to fix it. Steve asked me if I thought I could make it through the summer without it and I said I didn't know. He asked me when I would know and I told him I would probably know after a short trip. So, I scheduled a trip to Savannah next week. He wanted to know why a trip would help me make up my mind. I told him my air works when the car is moving fast but quits when I am idling and I'm pretty sure that the traffic idles a lot on River Street in downtown Savannah. He was excited I had come up with such a good test and agreed to go with me to judge it for himself. We'll let you know how hot we were when we get back and if I'll be able to do without the a/c. One evening this week, Steve blew a gasket and we drove all the way to Cleveland, TN to get one. I'm not sure where that teeny tiny gasket goes and on what but I'm sure he'll figure it out. He's smart that way! The next day after that, he decided he needed some cooling off because he was sweating so much trying to install that gasket. His shop is not air conditioned! I spent most of my day searching for him an air conditioning unit on that internet. This time, we drove all the way to Lowe's in Kennesaw, GA to pick up an a/c unit for him. I guess he couldn't make it through the rest of the summer without it! While we were at Lowe's we shopped for some toilets for the home. Steve is convinced we need a couple of them energy efficient flushers that saves power and water. He told the salesman we need a short toilet because I have short legs. I do have short legs but it was kinda embarrassing when the salesman made me sit on one of those toilets to see just how short of one I needed to do my business comfortably. I thought it was a little much too when he looked for a ruler and he had a 25 ft. measuring tape swinging from his belt. I was wondering why Steve even mentioned it. But I know he had my best interest at heart, not to mention the environment and Georgia Power. I forgot to mention I wanted to buy some of that ginger root at the supermarket because I've heard there are some pretty fabulous dishes that can be made with it. Steve told me "Nah" that he'd take me to one of them fancy Chinese restaurants in Dalton with the red dragons out front. I got so excited because I've heard they have a bridge and a fish pond you walk over when you go through the door. Steve told me he'd take me between 11 and 2 because they serve small portions then. I feel so privileged to have a concerned husband who is always looking out for my weight and well being. He said the prices are cheaper then too! I can't wait! I love my husband and our children. We are just one happy family!